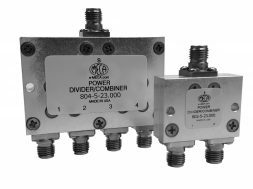 High power, 3 dB hybrid couplers are useful in Public Safety applications for combining two transmitters to share one antenna or high power splitting. They cover 350 to 570 MHz (UHF band). Unique air-line construction provides lowest possible insertion loss, high isolation, and exceptional VSWR.